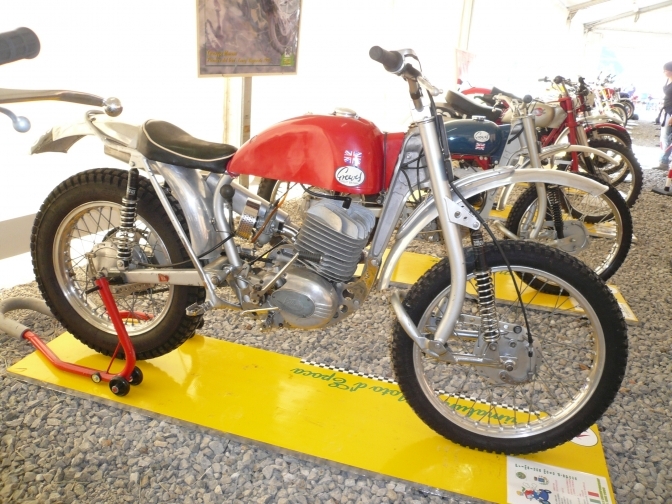 Trials Bikes built between 1958-1968. Because of the number of the trials models built by Greeves I thought we would start from the first model I owned back then so we start with the Greeves "Scottish" of 1958. with Villiers 9E engine fitted. Photo Courtesy and Copyright Lee Prescott. 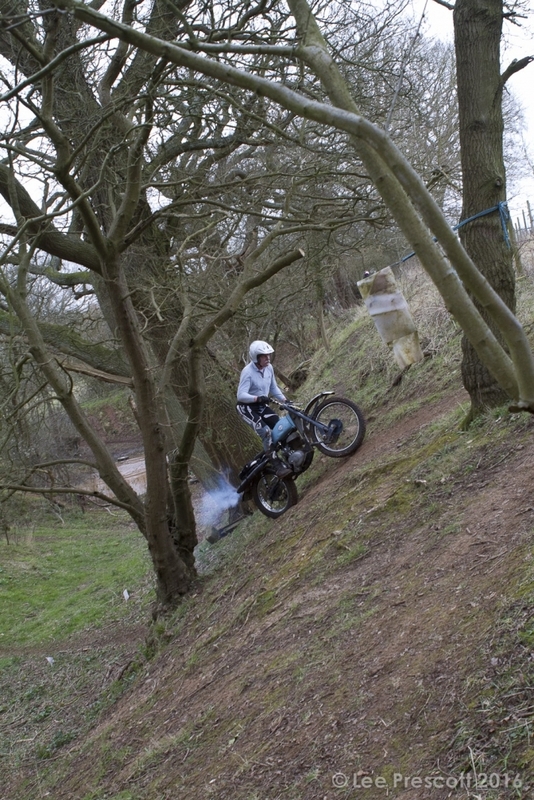 Andy Briggs is the rider. Is of a 1958 "Scottish", still with original type silencer fitted only painted black. Still with that Old plume of trailing blue smoke. other shots of the bike on the BMCA page. This was the model of Greeves I first owned Bought on the never-never from John Avery's emporium in Oxford.in 1961 second hand. The bikes stood out more than others at the time by the simple fact that they were different. 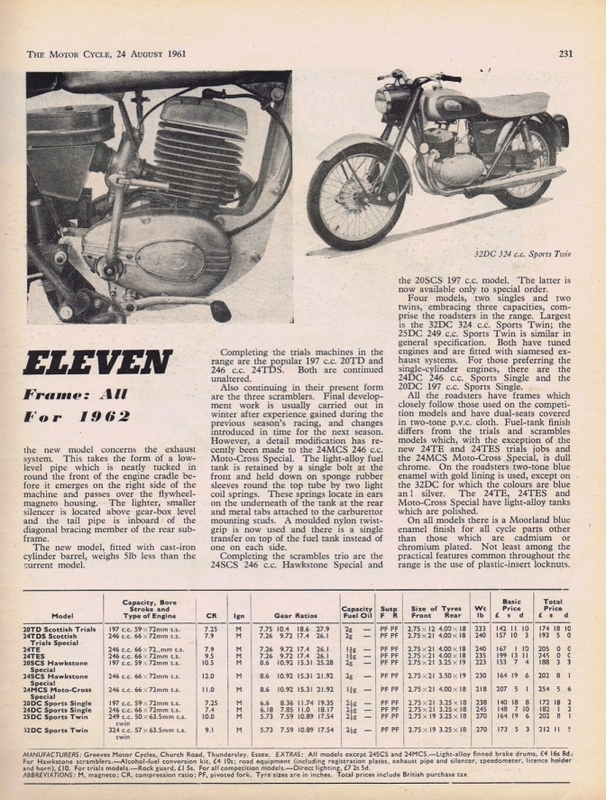 The bike below is from 1961, 20 TD model there is a difference in the subframe if you look. Thank's Simon for pointing this out, there were just so many models and minor changes were there not. With the die cast alloy front frame beam that took ages to get right, in the end having to tin the steel tube with alloy before placing this tube into the mould before pouring the molten alloy around it. To the distinctive "Moorland Blue" enamel the frame was painted with. The forks were unique to Greeves the earlier ones being more so. They were changed to the style above in 1957-8.
that all later small car trailers copied. The damping was by Girling hydraulic units working in the hollow fork tube. Greeves were also the first that I am aware of to use taper roller Timpkin bearings in the steering head, this is what saved my life probably at the time when I had an argument with a Fordson Major Diesel Tractor one lunch time. (story on seventy years). 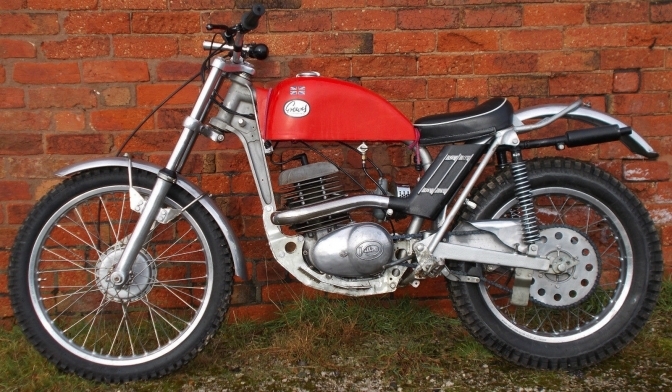 The trials models up until now were fitted with the British Hub so called "Tin" half hub brakes. One glitch with these I remember, that drove me mad,and was probably the reason I got rid of the bike was the fact that the rear sprocket on the wheel would keep coming loose despite having the New Nylon lock-nuts fitted like the rest on the machine. 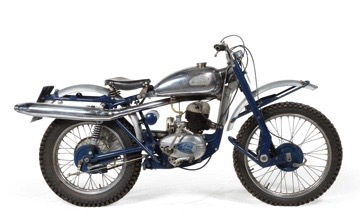 This is to be the 1962 model with revised frame and forks. 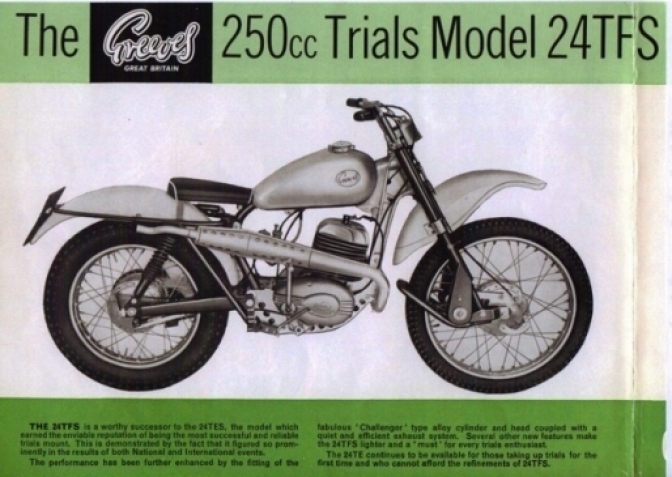 There just were a lot of Greeves Trials models and models in general. 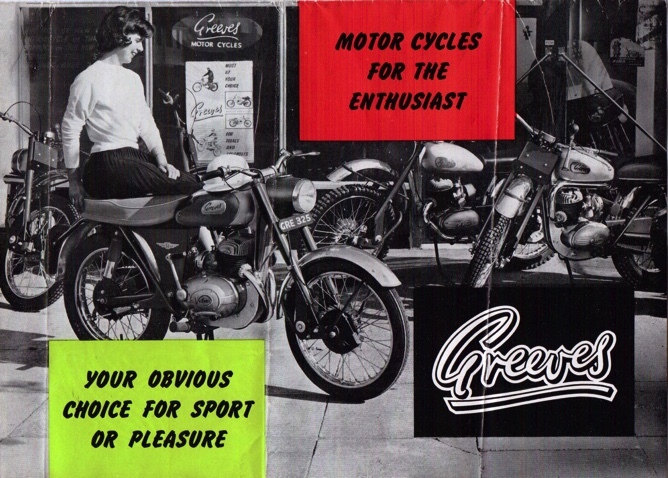 the choice was vast if you wanted to own a Greeves. 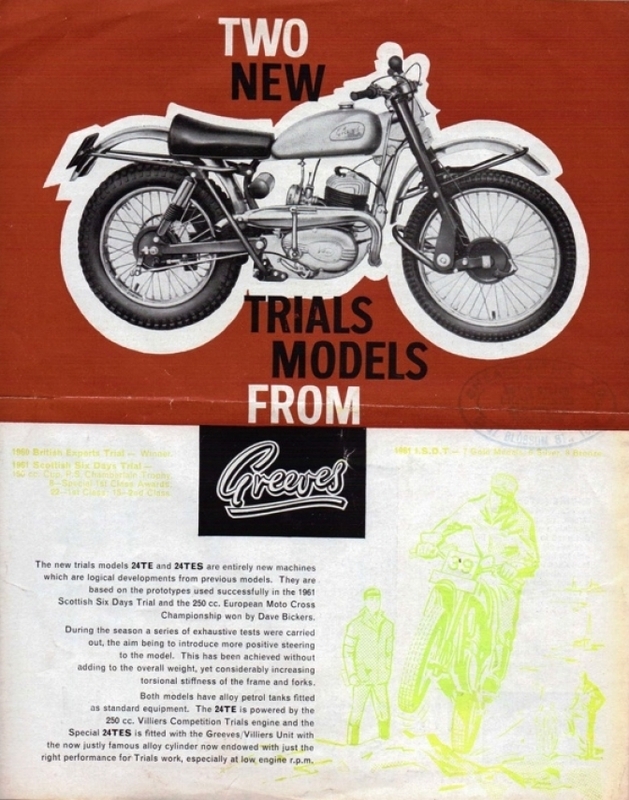 At this time 1962 there were probably more Greeves trials bikes being ridden as a two stroke than any other breed. 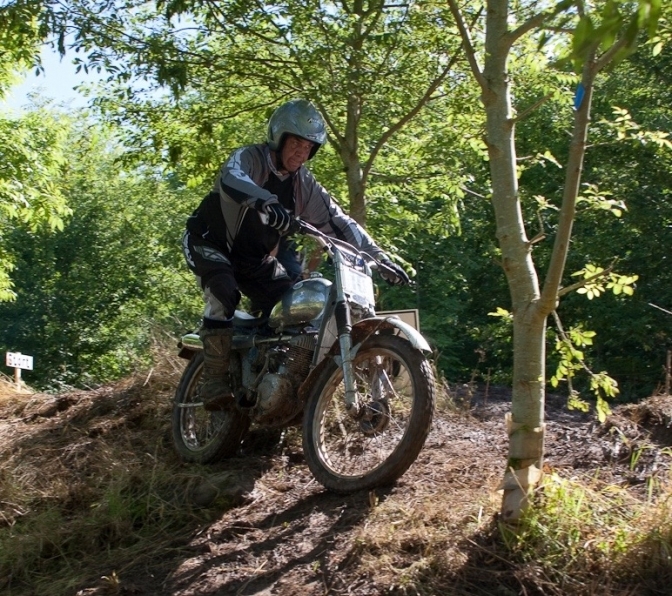 Not only was it the trials bike, but the Scrambles bikes of this period , influenced by Dave Bickers being on the black and white small television screen most week ends on a Saturday afternoon in the winter months riding in the BBC Scrambles series, and always covered in mud. Dave must have won more of these 250 races than any of the other competitors. This obviously influenced the sales of the brand. 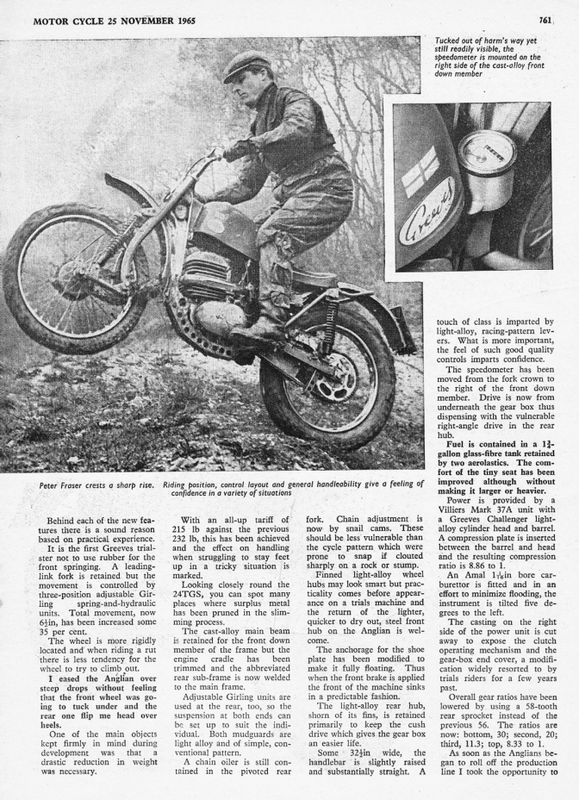 And with the outgoing Don Smith being there number one trials rider at the time, the sales were soaring. 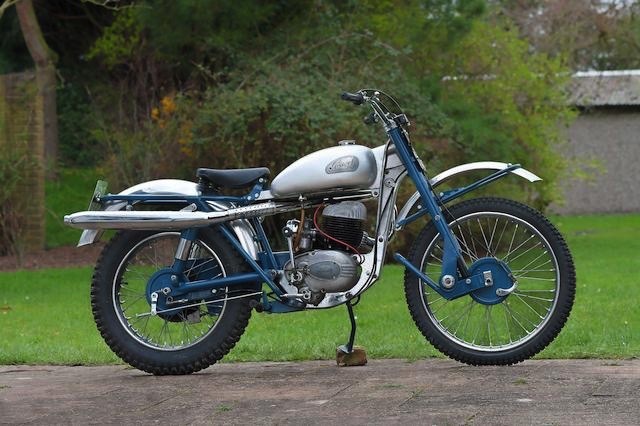 This is a 1962 Model TE and fitted with probably replicas of the Glass-Fibre mudguards, that Chris Butler used to supply the Greeves factory with. at the time. This bike is also fitted with the slightly later British Hub Company's "Motoloy" 6" alloy full width brakes. 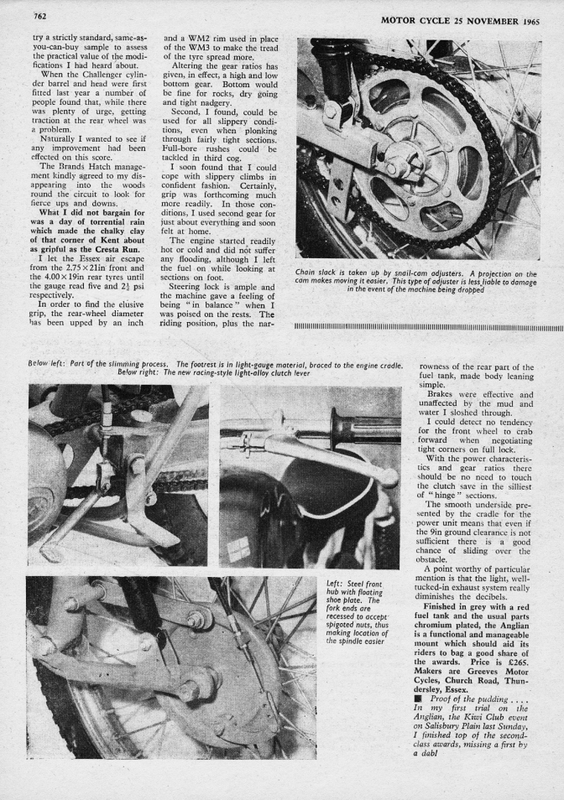 The British Hub company (born 1903) is interesting on its own and was mainly responsible for most of the Top end Cycle and Tandem brakes up until there demise in 1969. and liquidated in 1971. the best known model cycle brakes were the "Airlite" "Racelite" and "Solite" hubs. They also made the twin-leading shoe 8" racing front hubs for the Greeves Silverstone and Cotton Telstar racing 250's of the time. there last all Alloy cyle hub was designed for the New Moulten cycle of the late fifties. By the mid fifties there time of innervation seemed to be over at the British Hub Co LTd, and the production of cycle hubs were copies of the continental manufacturers. 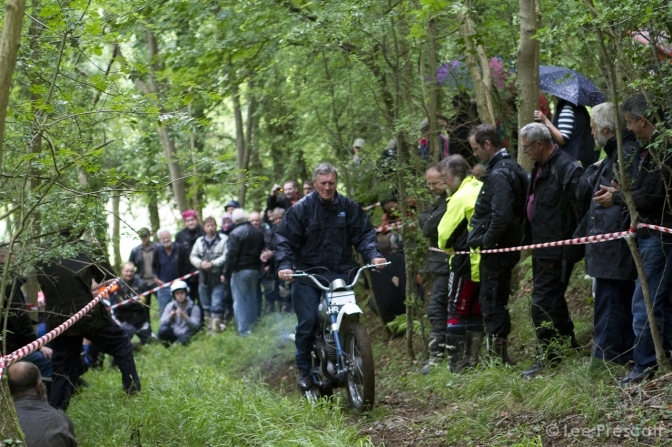 Photo Courtesy Deryk Wylde, OffRoad Archive. 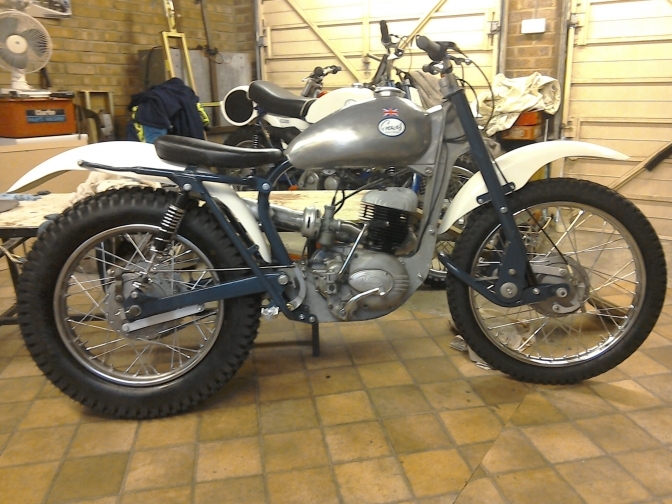 This is Don Smiths Greeves TES, prepared for the, and waiting to be used in the 1962 Scottish Six Days Trial. 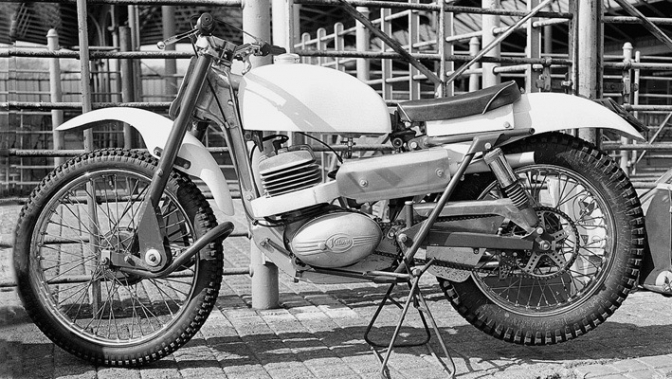 Note: that this bike probably has the first Square front exhaust (header) pipe fitted, that was unique to Greeves at the time. The fuel tank and mudguards are the ones supplied to "Greeves Motorcycles" by Chris Butler of Butler Mouldings. 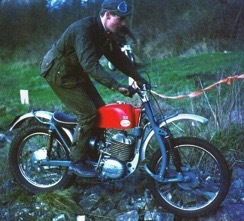 Photo Peter Stirland a long time Greeves works rider. Peter was always in the back ground at Greeves and also always in the fore in the results. A rider that made little fuss but just got on with the job. I think the only manufacturer I remember him riding for apart from Greeves was Royal Enfield on and off. This photo was taken by Lee at the Colmore Revisitation. Section, Camp hill near Broadway. Here is a 24 TE Scottish of 1963-4 with MP forks fitted. and an unknown smaller Half hub. Now we get to the Skip from the Scottish, to the Anglian. This is the 1965? Greeves "Anglian"24 TGS Model with the so called "Banana" forks fitted. 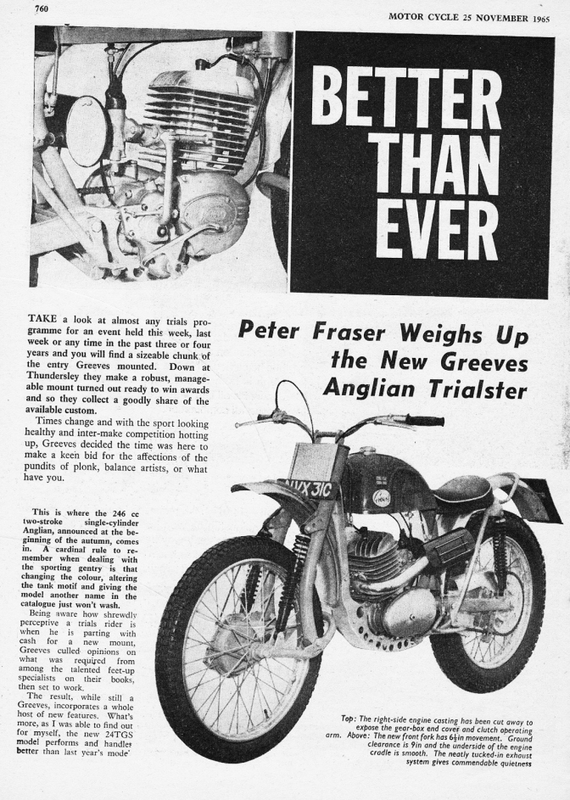 And the redesigned Greeves Ally barrel and head fitted, The "Silverstone" race bikes helped to prove the engines reliability. 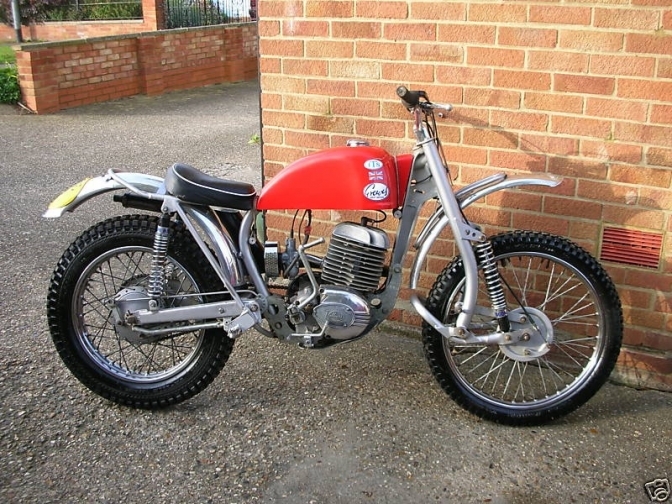 Simon> .Correct with the Anglian the 24TGS came out in November 1965 but the banana forks are the later type,the early ones had the shocks mounted on top of the fork loop and the rear of the loop was closer to tyre, same as this photo . This is the last Greeves Anglian model of 1968. and although Greeves were the least worried company using the Villiers engine at the time as they could have used there own. 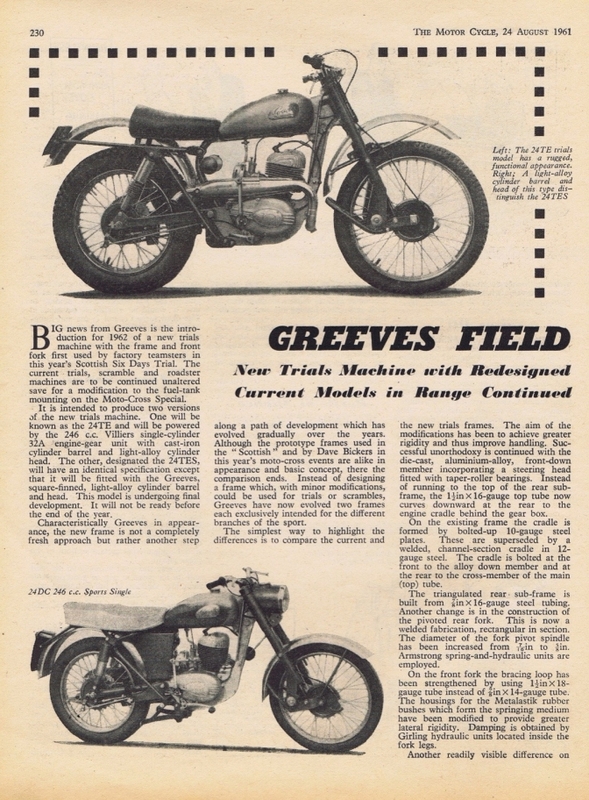 With Bert Greeves and Derry Preston Cobb wanting to retire anyway, A disastrous fire in the factory made the decision to end the Years of Greeves Motorcycles. So another British motorcycle company turned to ashes. and there is a lot to tell.